Winchester sits by several old squaws taken during the day's hunt in Penobscot Bay, Maine. A pro's way to rig for sea ducks put the odds in our favor. His golden eyes pierced the cold Maine wind--looking for a target. Every muscle under his thick, rich, chocolate fur was at the ready as he sized-up and quickly dismissed every gull and other non-game bird. As I admired his intensity, a sudden change in his attitude warned me that more old squaws were on their way. With barely enough time to turn and look in the direction of Winchester's interest, I spotted a drake doing his best to zoom past us. The magical moment was not to be broken. I bore down on the speed demon with my Ruger over/under, quickly sending a load of No. 2 steel on its way. The shot pattern connected and sent the beautiful drake cartwheeling and bouncing off the water. Having done my part, I sent my Master Hunter to do his. At the "back" command, Winchester's body catapulted five feet off the rock we were sitting on. He quickly swam to the floating duck, giving me another memorable retrieve to store in my mind's eye and relive for the rest of my life. Winchester and I were hunting old squaws from a small rock in Penobscot Bay. I had noticed it appearing quickly on the outgoing tide while I was getting considerable gunning for eiders, with guide Todd Jackson, friend Steve Kelliher and my father-in-law Bill Jakusik. Every time one of those speed demons buzzed the top of the distant rock, I promised myself a visit, when the tide pulled off far enough. I didn't have long to wait. The tide in that part of Maine is extreme--anywhere from 12 to 20 feet. And when it changes, it happens fast. That's how I found myself precariously perched on the small rock, with Winchester. There was barely enough room for the two of us. I made a point of not sliding off on the slippery sea weeds. The cold Atlantic was only 10 feet away. The best hunters and guides are conscious of the tide, as well as volatile weather. When rigging their decoys and anchoring their boats, they put some thought into being able to pick up quickly if things get nasty. Todd Jackson, proprietor of Penobscot Bay Outfitters (888-SEA-DUCK), and his guides have devised a new way of rigging on the old method of using a "mother line." The change is so simple I'm amazed no one had thought of it before. All you need to make a "Penobscot Rig" is plenty of quarter-inch Pot Wop (black nylon line favored by lobster men for durability and low cost), one large carabiner (found at most outdoor stores catering to climbers, or marine stores) and a very large danforth-type anchor. The size of the anchor depends on the size of your boat. Jackson uses an 18-pound anchor to hold his 21-footer. After attaching the anchor to one end of the line, you let out enough line to reach the average depth of the waters you usually hunt, adding an extra 10 feet for scope. You then tie a simple overhand marker knot. This is to mark the point where you can start connecting your decoys. Jackson places each decoy on a two-foot dropper line with large clips, which he buys at a commercial fishing supply store. The dropper lines allow retrievers to swim through the decoys without getting tangled in the lines. A tangled dog can quickly drown. Next, let out 30 yards of line and tie off an overhand loop. The loop is where you will attach the boat, with the carabiner that's tied to the end of a bridal permanently attached to the boat. You then play out the same amount of line as the length of your boat. Now place another marker overhand knot, and that will tell you where you should stop placing decoys. Then let out the final 30 yards and place a loop on the end, for a stem anchor line if necessary. Estimating effective killing range is very simple: When the birds skirt the outside or inside of the rig, you can feel confident they are in range. The beauty of the rig is, it's one continuous line, so you don't need to motor around and snag the line to pick up. If the weather kicks up, or some other emergency arises, all you need to do is pull in the stem decoys as you wind the line into a bucket, and then pull in the decoys out on the bow. After winding in all the line, just pull up anchor and off you go. Putting out decoys is just as easy. After anchoring, just start clipping on decoys until you reach the loop for tying off the boat. Attach it to the carabiner and play out the rest of your decoys. Then load your gun and get ready for incoming birds. You don't hunt sea ducks you say? This rig works great in diver hunting where you have a large rig of decoys to put out and you want the boat anchored nearby. When Jackson and the group motored away, leaving me perched on the slippery rock, I started to second-guess my choice of shooting location. In the worst-case scenario I would be bobbing for my Ruger over/under while taking a terrible ribbing from some dry hunters in a comfortable boat. I could only hope that they'd laugh so hard they'd fall out. "Well, no guts, no glory," I said out loud, to Winchester. As a distant seal gave me a strange once-over, I noticed a group of old squaws on a tail wind, doing their best to break the sound barrier--and heading right for us. One second they were hundreds of yards away; the next, they were right on top of us. The lead drake, sporting a long tail, was 20 yards out when I fired. One shot, one squaw. As Winchester made his way to the floating drake, I couldn't help feeling a little smug. Who was the fool now? Old squaws are notoriously hard-to-decoy birds. They shy away from any type of floating blind and rarely get close to shore. A minute later, with two birds in the bag, I found myself smack in the middle of the old squaw flight path, gunning one of the most difficult flying targets a waterfowler can pursue. Passionate duck hunters are never satisfied. They are always seeking the ultimate quest. Even though they might have sufficient gunning at home--in their special, secret spot--the prime-plume drake eider, pintail, bluebill or black duck can be an insatiable goal. It might be the challenge of that particular bird coming to the gun or a beautiful addition to the collection in the trophy room. That inexplicable passion is one of the things that prompted Steve, Bill and me to drive north to Belfast, Maine. We have eiders and scoters back home in Massachusetts and Rhode Island, but old squaws make only a brief appearance. The chance to harvest a few of the little sea ducks up north was very attractive. After a morning of unforgettable gunning, we motored back to the ramp. After giving Winchester a chance to run and air, we loaded up our gear for the drive back to Belfast. When traveling for a hunt with your retriever along, be sure to pack enough food and supplies, and a good first-aid kit tailored to help your dog in case of injury. During our hunt in Maine, deer season had just begun. My dogs rarely wear collars, but as a precaution I brought along an orange collar to be used while airing in the nearby fields. Back at the lodge, Jackson's partner, Sam Cassida, a graduate of culinary arts in one of the country's best schools, was waiting with a plate of appetizers: smoked salmon, oysters, trout, with a variety of cheeses. We shot a few games of pool, until Sam summoned us to dine on a delicious roast with all the trimmings and dessert to boot! It would be difficult to explain back home how we "roughed it" in Maine. On our second day, the weather changed for the worse. A strong wind from the northwest made for some equally uncomfortable and challenging gunning. We finished a couple of hours later than our first outing but still managed to take our limit of eiders. Back at the lodge, another plate of appetizers and a wonderfully prepared eider stew. It was hard to decide if the gunning or Sam's cooking was the highlight of the trip thus far. The third morning found us at the local Irving Big Stop, where Jackson likes to meet with his hunters for breakfast. We turned the other diners' heads as we walked in sporting camo instead of blaze orange. "Goin' after them sea ducks?" a local said with a smirk, looking me up and down. He was in blaze orange, head to toe. "Had to," I said. "All the stores are sold out of orange." I wished him luck at getting his deer. Since the weather was still nasty, our plan was to hunt a river leading into a sheltered cove and concentrate on old squaws. One way to overcome the squaws' reluctance to decoy is to set up in a narrow stretch of water leading into back bays, where the small ducks gather to feed during the day. After a quick boat ride, we set anchor and let out the decoy rig. As we loaded our guns, I looked over the angry waters kicking up whitecaps in the distant bay. I knew we had made the right decision to hunt in protected waters. Spotting a drake heading toward our waiting decoys, I called "mark off starboard side." Realizing this was to be a pass-shooting opportunity, Jackson called out, "Take 'em." The small drake made it past the first couple of shots sent hurriedly in his direction, but just as he neared the end of the gauntlet, a load of Federal No. 2s sent him bouncing on the water's surface. Carefully watching Winchester as he swam toward the floating duck, I was glad to see that the drake was not suddenly coming to life. Small as they are, old squaws have a reputation for taking solid hits and suddenly swimming away. Often, a cripple can lead a dog or boat on a long chase. Dealing with a fast current and cold water is enough for a retriever. Chasing a cripple for hundreds of yards can be downright dangerous. As Jackson helped Winchester into the back of the boat, we all settled in for the next flight. Looking over the beautiful drake's 10-inch tail, I almost missed my opportunity to take a shot at the next pair. Todd, Bill, Steve and I arose in unison, quickly dropping two sea ducks. "Can't you boys shoot better than that?" I said, as one of the drakes swam off, crippled. I wasn't sending the dog this time, so Jackson unhooked the boat and started after the swimming duck. After a couple of minutes of hide and seek we finally motored next to the drake, who was doing his best to escape by swimming for deep water. I sent Winchester after it. In the gin-clear Atlantic, we could see the old squaw trying to evade the dog by diving underneath him. It didn't take long for Winchester to figure out the game and two dives later, he grabbed the duck underwater--another retrieve that I will always treasure. With the prized duck in the bag, we quickly hooked up the decoy spread, once again appreciating the beauty and simplicity of the Penobscot Rig. The rest of the morning went on about the same, with several old squaws looking like small white beads attached to an invisible string--speeding to our waiting guns and managing to fly by, unscathed. They certainly lived up to their reputation as a challenge to the gun! Although mostly humbled, we managed to take eight beautiful drakes and had a great time doing so. If you are up to the challenge and want some memorable hunting and retrieving, travel up to the New England coast and give old squaw hunting a shot. Ruben W. Perez is an outdoor writer and photographer based in New England. 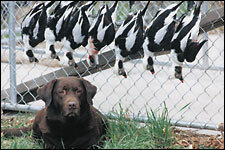 When not raising puppies or running his Labrador retrievers in hunt tests or trials, he is guiding for sea ducks, Canada geese, brant and divers. To contact him call 508/336-3755.